I came home from a board meeting and was starving. I’m due for a grocery store visit but I had to make dinner from what I already had on hand. It isn’t so bad when your pantry and freezer is well stocked. 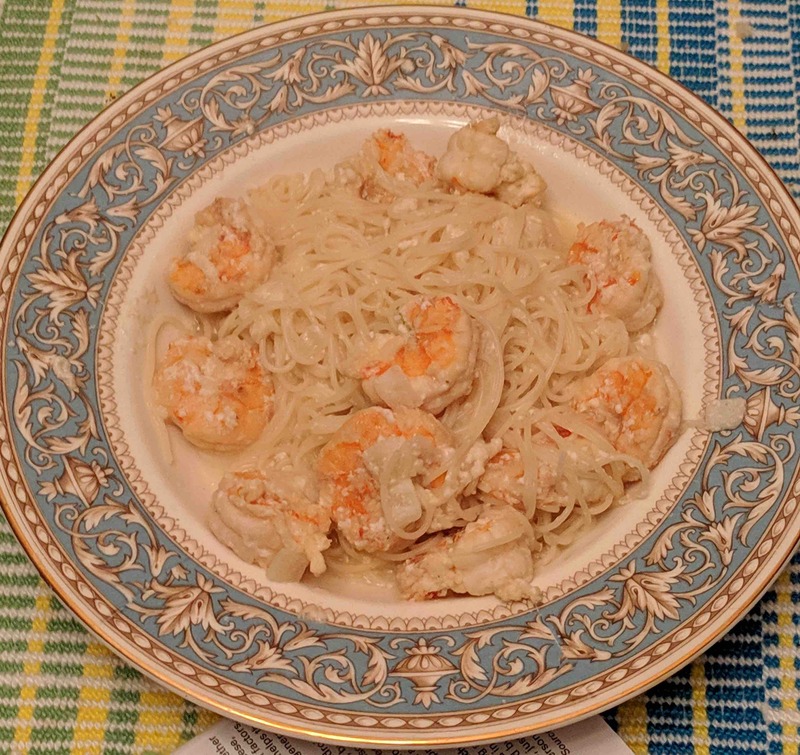 This is a prime example of a pantry sauce as everything in it either came from the fridge, freezer or cabinets: I used bottled lemon juice and I made milk from some powdered no-fat milk. I have some dehydrated lemon I’m using in place of zest. I keep a bag of diced Vidalia onion in the freezer and I used about a third cup of it. For the protein, the last time I boiled shrimp, I peeled some extra and placed them in snack bags and froze them for later use. It takes very little time to thaw them in a hot sauce as they are already cooked. Acid tends to break dairy sauces, especially ones with lower fat. To avoid this, I tossed the pasta with the lemon juice instead of adding it to the sauce. There may still be some curdling but it won’t affect the taste at all. To add a healthy twist, you can also add a cup of frozen broccoli. As you can see from my plate, I didn’t bother. Bring water for the pasta to a boil and cook the linguine as the package directions. In a small pan, melt the butter and sauté the onions for 5 minutes. Add the salt and pepper and stir. Pour in the milk and lemon zest. Bring the sauce to a simmer, stirring regularly and let it cook down while the pasta boils, about 8-10 minutes. Stir in the shrimp and broccoli, if using. Continue to stir regularly while pasta finishes cooking. Drain the pasta and return to the pot. Toss with the lemon juice. Pour the sauce over the pasta and stir to combine. Sometimes I get to craving the oozing cheese and multiple layers of lasagna but I don’t want to go to all the trouble to make sauce and do all the other things that a traditional lasagna entails. 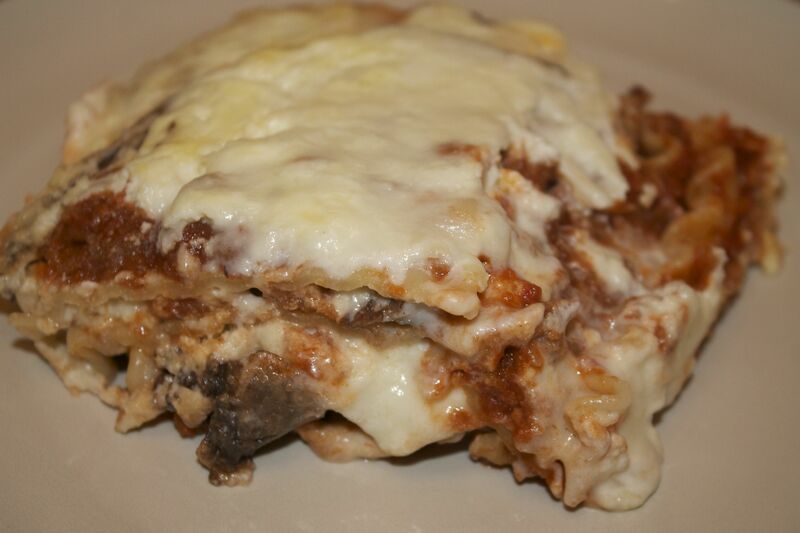 Here is my quick and easy lasagna recipe, that can have you eating in less than 90 minutes. Brown ground beef and drain before adding to the pasta sauce. If you want the meaty mouth feel without the meat, add the cup of Grape-nuts to the pasta sauce and stir well. Bring water for the noodles to a boil and cook lasagna noodles in boiling salted water. In a medium bowl, mix cottage or ricotta cheese, mozzarella cheese, Parmesan cheese and eggs. Stir to combine. Spread a spoonful of sauce in bottom of 9×13 pan. Then layer three noodles and put 1/3 of the meat mixture over the noodles. Place the sliced mushrooms across the top. Now, add 1/3 of cheese filling, dotting the cheese mixture. Continue to alternate noodle layers with sauce, mushrooms and cheese, ending with the cheese on top. Bake at 350 degrees covered with foil for 30 minutes. Then 15 minutes uncovered, until cheese is golden and bubbly. Let stand for 10 minutes before serving. Serve with garlic bread and it’s a dinner for the ages.